Sondra and I are on our way home from our trip to Durant, Oklahoma, to attend two more FMCA chapter rallies. RVing and war heroes is on my mind as we travel. It always amazes me to meet new people who are living the RV lifestyle. The purpose of our trip to Durant was to present the Lone Star chapter, which is part of the South Central Area of FMCA, their 50-year chapter certificate. Can you believe that a group of avid RVers has been together for 50 years? That is a long time to be having fun together. In a group like this, you make friendships that last a lifetime. The Lone Star chapter is very organized. At each of their get-togethers (we call them rallies), they have a printed itinerary of the events and activities that are planned. It surprised me that one day of their morning breakfasts has a cook-to-order menu. The morning cooking crew actually asks you how you want your eggs, how many, how many sausage patties, how many biscuits, etc. We have only attended one other rally with a hot, cooked-to-order breakfast. Have you been to a rally that does this? I would love for you to reply to this post and tell us your experience in this area. What are some of the unique things you do when you get together with your friends or chapter? At the Lone Star 50th anniversary rally, I met some really outstanding individuals. Since I am a former professional pilot, it amazes and honors me to meet a real life American war hero. He is Joseph C. Fazzio, F149767. This is his story. Joe entered the Air Force in May of 1950. He picked the Air Force when he and some of his friends were at a location where all four branches were recruiting. He didn’t choose the Army, because he didn’t want to sleep in trenches. The same with the Marines. He didn’t choose the Navy, because he didn’t like not seeing land. So he chose the Air Force. He took his basic training at Lackland Air Force Base in San Antonio. When he was just about to graduate, his DI told him the colonel wanted to see him in his office. The message: flight training is opening to outstanding recruits because they were losing so many pilots. He asked Joe if he would like to go, and Joe said that he jumped at the chance. He did his ground school in Atlanta, Georgia, and his flight training at Maxwell Air Force Base in Montgomery, Alabama (four months total). Joe flew the P-51, F-80, F-84, and F-86. He flew 358 sorties and was shot down twice — once in a P-51 over land and another time in an F-86 over the sea. Joe was trying to get out to sea and make it to the USS Lexington, an aircraft carrier. He said that he was going to try to land on the carrier, but due to the fire he ejected from his crippled aircraft and was picked up by a Navy helicopter from the Lexington. He said he was picked up both times by a Navy chopper and to this day, he doesn’t care for helicopters. Joe had four confirmed kills: 2 MiG-15s flying the P-51 and 2 Yaks flying the F-86. Joe said the worst day of his life was when his unit was involved with the “Bridges at Toko-Ri.” But as he said, they “got it done.” He also said the hardest thing he ever had to do was to write the family of one of his pilots who was killed in action. 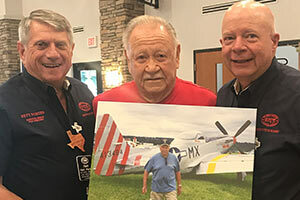 Joe said that he loved his time flying and to this day is still thrilled when he hears the sound of a P-51. If you know airplanes like I do, you know that the sound of a P-51 is unlike any other airplane engine sound. It still sends goosebumps up my arms. I asked Joe what he thought about the problems we are currently having with North Korea. He told me that they will not change and that they are no different today than they were when he fought against them in the 1950s. I asked him if he would consider going back to North Korea today if asked. He told me that he would go back in a heartbeat if he could! What a story about a true American war hero. I would like to thank Herman Mullins for getting me the details about Joe’s military career. Have any of you out there met a war hero in your RV journeys? I would like to hear from you. Finally, Sondra and I send our thoughts and prayers to the many people who have been impacted by Hurricane Harvey and Hurricane Irma. They include quite a few members from FMCA’s South Central Area. Not surprisingly, a number of other members have jumped in to help. For example, the Lone Star chapter began accepting donations for Harvey victims. By the time we left their 50th anniversary rally, the group had collected at least $1,000. And Lone Star isn’t the only chapter to come forth. 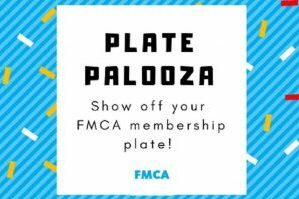 The generosity of FMCA members humbles me. It’s just one of the many reasons why our association is so special! Great story Jon – being retired military myself, I love to read stories about our vets. Do you have any similar stories to tell? Great article and experience for you. Thank you for sharing it with the membership. I do really penjoy reading about you and Sondra’s travels. Thanks for sharing, I enjoy reading about our vets, being Army myself. Jon, thanks for telling the story of Joe. It made my day. I’ll start looking for a war hero. They’re out there. Just signed up to get your blog. Looking forward to it. Hope to see you in Texarkana at the 6 State Rally. Lone Star is very proud of our friend Joe Fazzio. He has been an inspiration to all of us. Our chapter has quite a few veterans, just to mention a few, Rett Porter US Air Force retired, Joe Wright US Army retired, Jack Bryan US Air Force retired, Ray Bell (Lone Star’s breakfast grue) US Army retired, Glennon Woods US Marines who flew for a small air line know as Air America during Vietnam, Les Lightfoot US Army pilot. Others Veterans like Roy Fletcher, Frank Taber, and myself Herman Mullins. Lone Star has a combined 140 years or more service to our great country. And we all Stand.